I have laterally defined springs on the upper flange of my crane runway girder. The permissible Verfomung is now calculated on the distance of the springs, how can I change that? 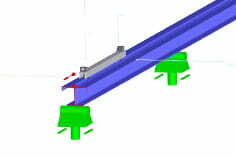 For crane runway girders, which are held laterally by a resilient spring (Schlingerverband), the procedure 3 is set under Details under "Permissible deformations". This refers to the length to determine the allowable deformation on the inflection points of the deformed rod axis. If the permissible deformation is to be related to the length between start and end support, this must be calculated manually.